UMTS as a technology allows for exciting new applications of some of the best ideas of services in the fixed telecoms, cellular/mobile telecoms, and internet environments, with many revolutionary new possibilities which simply do not exist in the current media and communications vehicles.The current worldwide interest in UMTS/3G is driven partly by the iminent roll-out of the new infrastructure du… ring 2002/3. 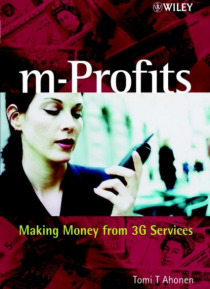 The general consensus in the telecoms industry is that that services will be driving this new UMTS/3G industry, and with no historical reference points, a large worldwide demand exists for this type of book. 'm-Profits: Making Money from 3G Servives' will discuss 3G services from the view of what is needed for the service to provide value to the user, which technical features of the 3G network will be used, what is the value proposition for the user, how will money be made out of delivering the service, and discussions on how revenue sharing propositions might work to benefit content providers and network operators. * Addresses subject from the viewpoints of network operator, virtual operator, service provider, content provider, and end-user * Explains how will money be made out of delivering 3G services * Covers the key issues of 'revenue sharing' and competition * Includes 12 service vignettes Essential reading for mobile operators dealing with marketing, product development, 3G people, content providers, business Development, mobile Services people, consultants, bankers and media professionals.